Stamping Ground: WOYWW? 177 oops....I mean 178..
What's On Your Workdesk? Well thanks for asking...I have to tell you that I'm constantly surprised that you still do. Here it is....taken in the good daylight of Tuesday afternoon and exactly as it still looks...I was called to greater service. Had to go do a grand prix around the supermarket. I know, it's all glamour. Ooh look, I'm Mrs GotTech - the iPad and the out-of-date-but-still-OK-for-me iPhone. One was in use entertaining me with a series on how Spain was born and the other was entertaining me with various messages. The squirty bottle is filled with bubblegum scented stamp cleaner. Really it is. I found it during a clear out and I reckon it's over ten years old. Hasn't improved the smell any, but it still works! You can see a lovely wood mount stamp by Artemio - a Reindeer,as I live and breathe. As yet unused. A bag full of Kaiser tags in Kraft...strewn a bit so I could see how many of which shape per bag. And there, plonked in the middle is a very valuable and much used notebook. More to the point, I've finally used the WOYWW Crop kit contents. And made a much overdue embellishment to the front cover of the notebook - now I can tell which way up it opens! Of all the homework I've seen with this little challenge kit, I've been surprised that no-one else has cut off the black keyline which I drew for the house shape...but I don't know why I'm surprised. Nothing should surprise me about the way clever people interpret my stuff! Now that's enough from me. Time to play - please join us. Show a photo on your blog of your desk/works surface. Link here but please be sure to put WOYWW in your post title. Visit as many as you can..because it's fun. If visiting as many as you can turns into a chore, then stop trying to visit so many! Everyone understands, it can be very time consuming! Oh and to answer a lot of enquiries...there is no contest to be No 1 on the list per se....and I try to make this a scheduled post for about 1.30AM London time..gives our non Blighty dwellers a fair crack at posting in daylight. However...sometime that will change so that the Blighty dwellers don't have to stay up all night....turn and turn about! I think your counting has gone backwards lol its 178 this week. Yippeee my ipad has returned but it does look abit square, in the Southern Hemisphere they are oblong. What a lovely card! Bubble gum scented cleaner? I think I have some of that too! Have a happy WOYWW - and, surprise, surprise, you get to see my DESK this week! that could almost be my desk, I recognize so many things that I own, did you pop over here this week? I have a similar reindeer stamp and same, not yet used, but probably 3 years old! well, I was just going to bed, but I'm glad I didn't coz that means I can have a little lay in now! My glue thingy always clogs up! and I do like your spotty house, or is that, dotty house? Happy Halloween... (I don't do it, but I do buy the sweets in case kids come round... and then eat them all..) ((Lyn)) #6 I think! Cute little book cover and that reigndeer stamp is a cutie too what are those tag stamps ... can't make em out. Hey who are you kidding trying to get number 1 here is a challenge in it's self for those who make it BUY A LOTTO TICKET LOL!!! congratulations for winning this week, Brenda! what? there's no contest!? your out of date iPhone is still hi tech to me. my phone is so out of date that when i was in Korea, it didn't even work! i guess it's time to get a better phone! great stuff on the workdesk today, Julia! happy WOYWW! Hi Julia, and thank you yet again for all you do for us, and for giving us such a fun time each week. 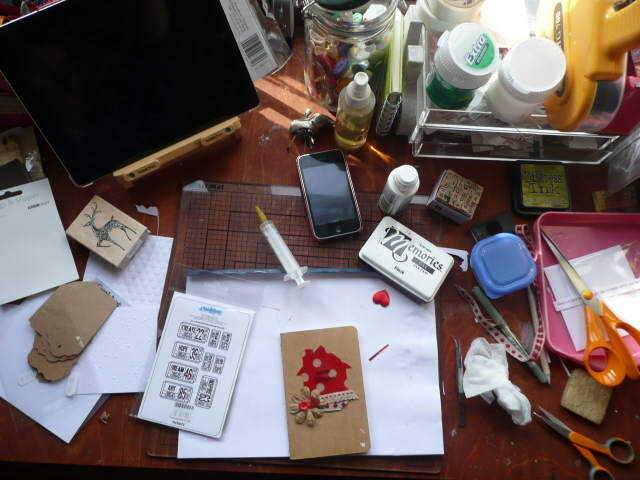 Your desk looks very busy - and isn't it fun finding old stuff you'd forgotten you had? Not sure I'd like bubble gum scented anything, but if it does the job... lol! thankyou for hosting again, your desk is always so interesting, I'm so glad to be back! It's like getting something new, when you "shop" in your own studio! What's in this very important notebook. I bet all your crafting secrets! Love your image! Happy Halloween! Thanks as usual for hosting! Happy Halloween! What's in the syringe on your desk? Oh and I love the little shoe pin cushion! Ah, yes, the glamour of the supermarket is hard to beat . . . Julia, your cell phone is the latest and greatest compared to mine, very fancy! Oh the cutest little note book ever. I love it. And if you think your iphone is out of date, I don't even have one let alone an ipad! BJ #35 with disco phone! Great "chuckly" post as usual Julia.. Your notebook is gorgeous and I love that reindeer stamp. Your phone is way ahead of me, I have a dag one. It's just a phone, thankfully as I could never work anything else. My little miss has to have an ipad for school next year and I'm dreading that. Those touchy feely things hate me, give me a big clunky keyboard any day. The world is a strange and wonderful place sometimes and it would be a boring one if everyone did the same thing. Hi...having a fun snoop around your desk. I do like your notebook cover...Very pretty. And that is a cool reindeer. Have a great week and see you next week. I am so untechie, but have a wonderfully techie son that keeps on trying to teach me...guess he still thinks there is hope LOL! I have the oldest dang blackberry still...mostly because I can only find it about a quarter of the time! I hear phones all day long, so not much interest in them the rest of the day...but know that ipad piques my interest for sure! You're rocking a rather tidy desk this week! Thank you for hosting such a fun time!!! I too have an out of date, but just dandy by me iphone!! If you can find some steel pins, they are fabulous for sticking in the tips of glue bottles and syringes to keep the tip unclogged. Oh, and if you say it's 177, then it's 177. You are the Queen! Great crop kit make....never considered cutting inside the black line and making it into another shape! Well, it's 11: 19 Tuesday evening in Vancouver...but it has been Wednesday in England for quite some time. I never know if we in Canada and the other outlying countrys are supposed to wait till Wednesday in our own Countries or not...??? You win the award for the best use of the crop's goody bag contents.! Congrats on the TV and radio coverage...you are famous! Happy WOYWW, enjoy the week and have fun bopping around the circut. #54 about 1:30AM in the states with a pretty calm full moon. Happy WOYWW. Lovely busy desk as usual. Full of tech - me and hubby are not fans of Apple (well, we admire their styling and I stroke any of their products when in a shop, but not a fan of the price! ), so strictly Microsoft in the Wade household. Hoping to get a tablet soon - keep hinting and hoping! 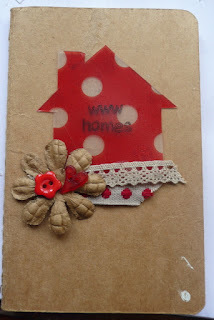 Back to crafting - love the notebook cover decoration. I have got a thing about notebooks - I think there are 5 on my desk at the moment. Ali x #55 ps Of course there is competition to get to #1, but no hope here even when I get up early. I have those tickets stamps as well - using them yesterday on a birthday card - too early for Christmas cards for me. I know the clocks went back last weekend but a whole week - must have missed that one. I love your little notebook cover, Julia, and that's an adorable reindeer stamp you are getting up the courage to use! Have a great week and thanks for hosting, as always! Morning Julia!! Good to see you've done your homework lol! I have some of that bubblegum cleaner - it truly is the most awful pong, not offensive but really gets up the nose! I do wonder what is in manufacturer's minds sometimes, the natural product can't smell any worse. Happy WOYWW! You have NO idea how important it is to be #1 at WoYWW. To be in the top 5 is a challenge, since so many people with fast internet accesses are vying for the position. I LOVE that reindeer. Very artsy. And I see you put your house to good use by placing it on a notebook. I got a laugh at the fact YOUR clocks were set back to standard time last week, while we Yanks don't move ours until next Sunday (Nov 4). We have to be different. And I adore that you have no idea what WOYWW this is. Just goes to show we all lose track of time on occasion, especially when life gets in the way of blogging. Have a great week dear friend. Even though I'm not playing this week, I'm still up late. Happy Halloween... I love the little house on the front of your book... Reminds me of Noddy and Big Ears for some reason. and such a beautiful country and people - odd what a few bad uns can do eh? Hey! Got to play this week! Means life hasn't been too hectic! Love the notebook - the little house is super cute! Thinking that you watch far worthier stuff when you're being creative. I seem to gravitate to "Murder she wrote" *hangs head in shame*!!!!!!! cor how high tech are you?!? i dont possess and i anything all far too high tech for me, my phone just about texts and calls if it is in a good mood!?! I love the smell of bubble gum! That notebook looks like the ones we used for the Sketchbook Project 2012 Julia. Hey maybe you could use it to join my new blog SKETCHBOOK FRIENDS. Oh, I love your little house collage - so cute! ooops! I've made my homework cards but forgot to post them and amazingly... I DID trim off the black lines of the house! We are only getting to see a little patch of your desk this week.... makes me curious what lurks beyond......???? Ohhh very cute little notebook cover. Love the reindeer stamp and will look forward to seeing what you create. Its my first time joining in so will go and have a nose around your desks! Love the notebook front. I want to get back home to my little space and also work out whether I need an i-phone or a mobile router and tablet, decisions as techy as that are giving me a headache. i don't even know what they are!!!!! I didn't get to play today, but I will be visiting as many as I can. Love your desk space this morning. Looks like you have a lot going on. Happy Halloween! No chance of me being No 1, I'm always chuffed if I scrap in below 100!! Great looking desk, Julia, love the streak of sunlight and that strategically placed little heart. Happy WOYWW Julia et al. There, that about covers everyone in one hit! LOL! I want to come and play at your desk Julia. Loving the new-look notebook. Your notebook looks pretty. Love red and kraft together. Yep, I started making Christmas cards too. It's never too early! I enjoy woyww so mauch each week! your desk look a little sparse this week Julia, been cleaning? A pretty notebook ... and thanks for the reminder about the bubblegum scented stuff ... now where did I put mine? Back in the game! Yay! However I do it, my link doesn't seem to stick today. Weird. Well, I'll just post it here too. Well we quite like linking at the over 100 stage, as it matches our combined ages!! We need some bubblegum scented stamp cleaner, mm mmm. I haven't got a fancy phone at all,just one that is used for emergencies which hopefully don't happen. Got the iPad though (as you will realise from my post last week). Got that reindeer stamp too and the syringe glue. Don't know about you but these dark nights sure make me sleepy. Yeah - I have something to share today! :) I'm loving the kraft tags on your desk. I adore anything kraft these days. I have the same iPhone and while the lag time annoys me, it still works fine so I can't justify an upgrade. Behind the times I guess but that means more money for crafty stuff! Happy Wednesday! I love the daylight shots and I don't have an iPhone, so an out of date one would be okay for me too :) I have quite the soft spot for notebooks, and yours is no exception! Woopsy ...as Robbie says when he forgets to do something ...I forgot to comment. The thought of the bubble gum smell actually made me want to heave. It's my first time to join. I only came across this blog last week (Yeah I think I live under a Rock!!!) I have left my linky and I shall be having a look at what others have on their Desks. Thought at first house had holes in it and you were using up snippets but then looked again and realised its spots. Love the look. Pleeease can someone explain why I've been at #102 all morning and now I'm #98? Something but I don't think it was Hurricane Sandy in the East coast had my computer not connecting to the internet world so I went to bed Wed your time and debated if I wanted to be #112 on Wed UK time! Oh well, bubblegum scented stamp cleaner might lead me to try and add it to glue and chew it LOL! 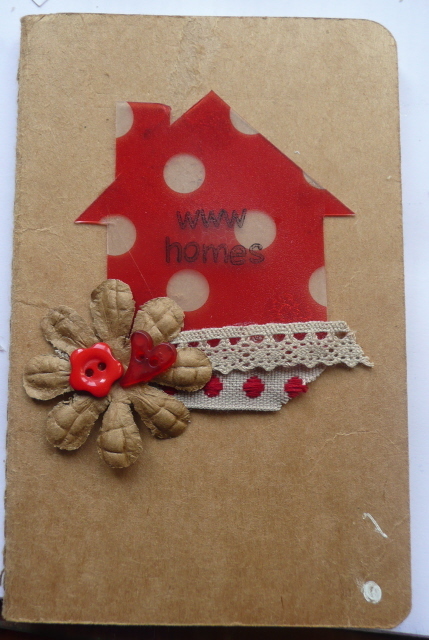 Your card is cute it the polka dot home vellum? I Love that bubblegum cleaner! Mine is in the caddy, with only about an inch left. Mine too is between 10-15 years old...(I've been saving it... do you think they still even make it any more? I love that reindeer stamp...I can't wait to see what you do with it. Have a Happy Halloween. Yep, cool reindeer stamp. Very nice note book cover! I love the cover of your book! It looks great! First timer here!!! Thanks for hosting this! oh how super sweet is the cover!!! wonderful work!!! I'm back after missing last week....and oh darn it, in my haste I forgot to add what WOYWW is all about on my post. LOL. Gotta go back and do that!! Happy Wednesday! Love the reindeer stamp and your addition to your notebook. Very pretty! Not linking up (again) but there's a few desks that I plan to visit. Hope to join in next week. Happy Halloween Julia have a fine crafty day. Love your present project on your desk. Sweet notebook embellishment. I'm glad I'm not the only one with uninked stamps. Isn't that clever of you to put something on the notebook so you know which way it goes! That sounds like something I would do when I was down to the last 5 pages. Hopefully, you didn't wait that long! Happy day, Ms. Techy! Happy Hallowe'en, you're book looks great. Cute reindeer, but it's the ticket stamps I'm coveting! Loving what you've done with the little notebook. Why can't they make a chocolate scented stamper cleaner? I mean honestly I might actually use one if it smelled good! Happy Halloween, Julia! I get later and later on the fun but maybe after the holidays will be back to whatever normal is...darling notebook!! I just realised I forgot to comment last night! I was ready for bed, our clocks haven't changed so your post went live at 9:30 for me and not 8:30, so I just linked and ran!! I've enjoyed seeing what everyone came up with from the goody bag, they're all so different. Me, I like the black line, it gives the house definition! I never got round last week to answering your question about my augur -- in fact, I'm still not certain what you were asking about! I suspect I lack the requisite British craft-ese to interpret you properly. re: comment on my blog. Don't know about the sticky sheets you are referring to. I use felt on the back of all my cloth flowers. I use them for hair clips, head bands, decorating clothes or altering photo frames and such......I am just making up a bunch and then I will decide how and where to use them. I had to smile as I have some of that Bubblegum stuff. pretty embellishing of your note book. Are you about to use that neglected reindeer stamp? I notice on some WOYWW blogs mention of us being on radio.... It was ME!! I was interviewed on BBC Radio Merseyside about different ways of socialising. (I worked there 8 years before I retired.) When I mentioned blogging we talked about how friendships can be made via web groups and WOYWW etc. Thought I'd better let you know as I never thought it would be picked up by anyone other than locals! I'm not surprised nobody else cut the black line off. I dont really know why I didnt.... just didnt seem right. Your desk IS looking might techy this week! I think an iPad would be so much fun!! So, what's in the syringe-looking thing right above your notebook? Is that like a type of glue? Bubblegum scented stamp cleaner? Scary...but interesting! Haha! Thanks for the visit and your sweet words this week. I'm super excited about the Silhouette...but haven't done a thing with it yet, except stare at it. It IS going to be hard to learn I fear!! Wish me luck!! Shame on you Julia. A stamp with a reindeer UNINKED!!!! Naughty girl! Nice little front on your book now for you to work out the front! That reindeer stamp is so cute. But he did phone me long distance, and collect, to have me tell you he really wants to be an image on your next Christmas card. Your house notepad is terrific. Have a terrific week. I made it Julie. Actually posted on Blogsy. Someone on this group told me about that program and how it works for iPad. Quite a challenge. Now to check out newly installed fridge and hope i can start creating again. Thanks for your visit and comment, Julia! Yes, really enjoying getting on with the knitting now. What a good idea to make bags with the tapes - knitted up, they should be nice and strong. I could also perhaps incorporate some wooden beads and decorate them a bit. I just hate the idea of it all ending up in landfill! As for the annotating, no, I'm not a natural annotator as I work, lol! My work space is pretty small, because my space isn't that well organised. When we move, I shall start organising a room from scratch, now I know what I need, and things should be a lot better.